A chest of drawers makes the ultimate statement in terms of style and function and is perfect for completing your bedroom furniture design. Chests of drawers are indispensable items of furniture due to their great storage capabilities and timeless appeal. As a staple piece of bedroom furniture, or even as a great storage option in the living room or home office to keep things tidy, a chest of drawers is an ideal addition to any room around the home. Whether used to keep your clutter under control, store your belongings, or serve as a beautiful display surface, you can rest assured that when you buy a chest of drawers from us, it's built to last. Made of 100% solid hardwood throughout, you know that it will be durable and look great from every angle. Dovetail joints feature in all of our drawers for the highest of strength, style and performance. The backs, bases and runners are also solid hardwood. When buying a chest of drawers you should also consider the shape and how it will fit within your own space. If you're looking for something that will make the most of small tight spaces, then a tallboy, with narrow drawers stacked on top of each other, would be the way to go. This type of home storage is brilliant for and it does a great job storing stuff that would otherwise get lost in larger pieces. It will also help you categorise more effectively. On the other hand, a wide chest of drawers will provide you with slightly more space for bulkier items and it will look great when placed near a bed due to its lower height. Available in more than 20 styles to match all of our ranges, and in different sizes so you can use them around your home, even in a narrow hall. Whether you're looking for an oak, mango or painted (including grey, cream and shabby chic styles) chest of drawers, we have exactly what you're looking for. And don't forget about our free delivery options, as standard. 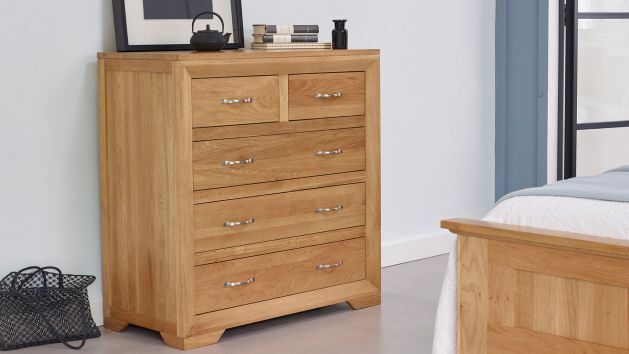 Browse our selection and find the ideal chest of drawers for you.